Thank you for taking the time to read Leah’s story. 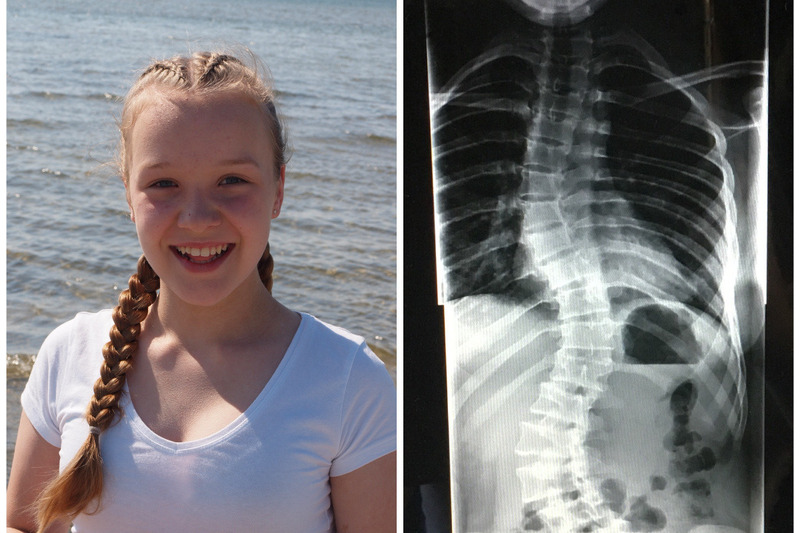 Leah is our amazing 13-year-old daughter who has been diagnosed with Scoliosis – an abnormal curvature of the spine, also known as AIS (Adolescent Idiopathic Scoliosis). Leah is a kind and loving girl, she is funny and incredibly creative, loves art, tennis, Taylor Swift, her iPad, horses…. but more than anything else, her passion in life is dance – in particular ballet. She has danced since she was just 4 years old and simply adores it, despite various challenges in the form of health setbacks along the way. Leah is also very hypermobile, which has resulted in multiple dislocations of joints, most notably of both her knees, but her commitment and determination to work really hard with physiotherapy to recover and return to the dance studio has been nothing short of remarkable. Given her dedication and the sheer joy that dance gives her, flexibility of her spine is so important and it is heart breaking to contemplate that she may not be able to enjoy this in the future. Leah was diagnosed with Scoliosis in the autumn of 2016 after I noticed that her lower back didn’t feel symmetrical. The diagnosis came as a huge shock to us but we tried to remain positive for Leah’s sake, whilst trying to come to terms with what this meant for Leah’s future. Over the following months the curvatures have continued to progress and it became increasingly clear, as recently confirmed by her Consultant, that surgery will eventually be necessary. Leah has a triple curve, main part of her spine is “S” shaped and her lumber curve is very low and atypical, as positioned very close to her liver, and therefore making the surgery even more challenging. Leah has started to experience pain on a regular basis, which is impacting on her ability to participate in many of the activities that she enjoys – PE at school, tennis, riding her bike and off course – ballet! Doing nothing is simply not an option – it will result in ongoing deterioration of her condition and eventual disability. In the UK this would likely mean a major operation known as spinal fusion. It involves titanium rods being inserted into the spine, fusing the vertebrae and thereby straightening the spine. As the fusion takes place over time this would eventually make her spine a solid structure of bone. Sadly, it will also limit any further growth and more importantly, it will severely limit the flexibility and movement of her spine. For a dancer this is obviously devastating news and we all struggled to come to terms with this. Throughout, Leah has often stated that she will do whatever needs to be done “as long as I can continue to dance afterwards” – a promise that we simply couldn’t make her! How is that possible? Well, titanium screws are likewise inserted into the vertebrae but instead of using metal rods, a flexible cord and tension is used to align the spine into a straighter position. This allows for further growth and the all-important flexibility to be maintained. We recognise that no surgery is risk free but we are nevertheless convinced that VBT offers the best long-term outcome for Leah’s health. Finally, we now have hope that something can be done that will not compromise Leah’s ability to enjoy a very active lifestyle, including dance and free from pain. We have been to Germany for a consultation with a Spinal Surgeon to seek further advice and clarification in regards Leah’s suitability for this surgery. Thankfully, she is deemed suitable and a date has now been scheduled for Leah to have surgery on 22nd November 2018. Unfortunately, seeking such major surgical intervention abroad comes with a significant price tag. We have now received confirmation that Leah will need two curves tethered to achieve the best correction and therefore we need your help to raise the funds to make this possible. Cost of the surgery alone is around €47K and does not include other expenses, such as insurance, cost of stay and related aftercare. Appealing for help in this way is not an easy thing for us to do but we now have limited time to raise the funds and with your help we know we can achieve this for Leah. Leah was born prematurely at 32 weeks, weighing just 3lb 15oz and so we are immensely grateful to the NHS for the excellent and outstanding care that we have received for Leah over the years, and no doubt, will continue to experience in the years ahead. At present, VBT is not offered by the NHS and whilst it may be sometime in the future, we simply do not have the luxury of time in waiting for this to change. As Leah's parents we only want what we believe is the best option for our daughter – she deserves the opportunity to live a full and pain free life. VBT is a life changing opportunity that offers her just that and we would therefore be hugely appreciative of any donations, however small - it will contribute to making a huge and positive difference to the quality of Leah’s life. Please also help us by sharing this information with as many people as you can - family, friends, colleagues and acquaintances; getting the message out and raising awareness of Scoliosis is likewise key. All monies raised will be put towards the cost of surgery and related aftercare. In the event that surgery, for whatever reason, becomes unavailable for Leah, then we will refund all funds donated. Thank you once again for taking the time to read this and for your support. 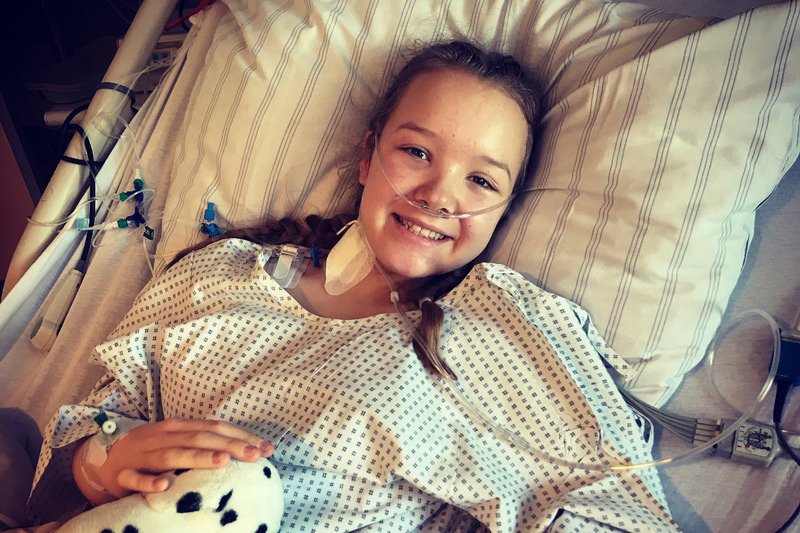 As Christmas is upon us, we reflect and count our many blessings…….. our family and friends and off course, the wonderful support we received from them and strangers alike, which made it possible for Leah to have life-changing spinal surgery in Germany. It doesn’t matter what Santa brings, we have already had the biggest gift imaginable – Leah’s successful surgery and good health! Long may it stay that way. We would like to share Leah’s pre- and post-op X-Ray images so you can see for yourself what your donations enabled us to achieve for her. You have made a very real and positive change to Leah’s life. Once again, thank you for your support, we will always be grateful! Wishing you all a very Merry Christmas and a Happy & Healthy New Year! We are now back home again following Leah’s successful and life-changing surgery in Germany, just over two weeks ago. We are so pleased to report that the surgery went really well and the correction achieved is amazing. The curvature of Leah’s spine has been reduced from 45 and 50 degrees to 10 and 12 degrees respectively. Leah obviously still have some way to go in her recovery but she is doing very well. We await physiotherapy now to support the spine in its new and much healthier position. This update is to say a massive and heartfelt “Thank you” to each and every one of you who have donated and supported us along the way. 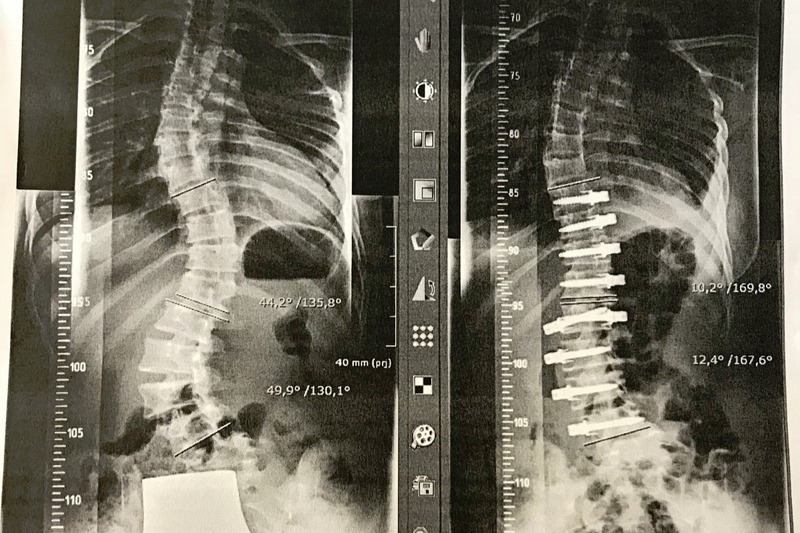 It is thanks to your kindness and incredible generosity that Leah was able to have this surgery and she can now look forward to a future with a much straighter spine, free from the prospect of disability and free from the daily pain she endured pre-op. You have done an amazing thing in supporting us to make this happen for Leah and for that we will be eternally grateful! We did a cake sale yesterday at Bluebell Ballet Studio, where Leah dances and an array of delicious home baked treats were on offer. We raised an impressive £172.33, which is amazing! Huge thank you to everyone who supported us, either by buying our cakes or baking them for us to sell, our friend Sue for organising the cake sale and to Miss Sarah Birth for kindly letting us sell the cakes at the studio. Hope everyone enjoyed the cakes!